“Dude,” I called from deep in the bushes. “Yeah?” Steve shouted from camp. I poke it with a stick. It was packed with salal berries in a soft crust—Mother Nature’s bakery. We looked around in silence. It was the first hour of a week-long hunker on a tiny island at the edge of the remote northwestern coast of Vancouver Island, British Columbia. If the island was already occupied, we’d have to move. Our island has no name. It’s about 10 acres with a green-water cove protected in any weather. Three sides of the island face the open North Pacific with several square miles of fish-packed reefs. 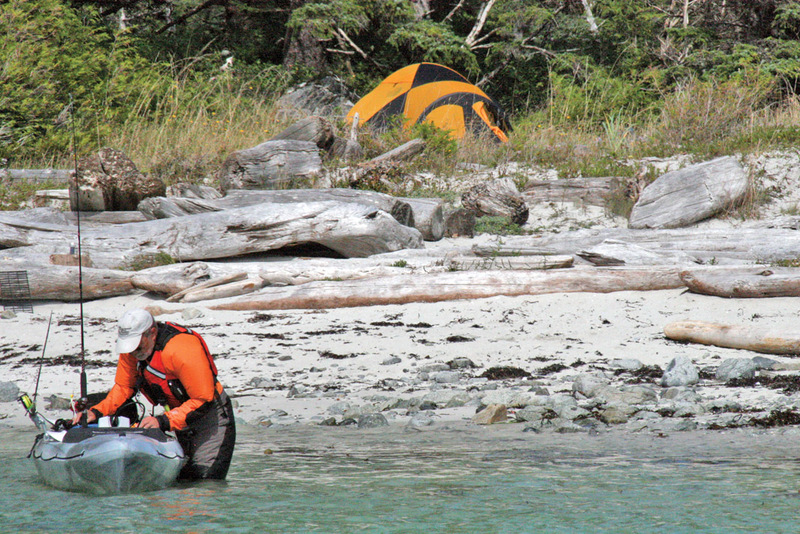 In other words, one uber-sweet kayak fishing base camp. Too good to share with a bear. A thorough scout of the island revealed no resident ursine so we turned our attention to fish. The water teemed with black rock bass, greenling and ling. A salmon highway passes close to shore; we expected to find coho at the surface or off the river mouths. 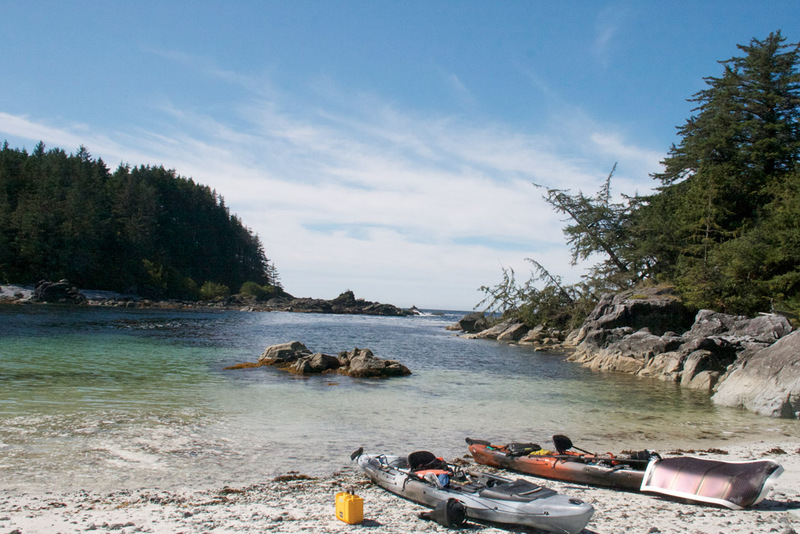 As an outdoor writer, I have spent many years exploring the waters around Vancover Island paddling and fishing out of a touring kayak. This was the first time I would put the paddle down to motor around the island. 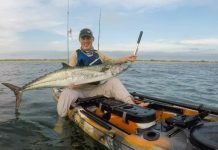 Wilderness Systems’ Thresher kayak is a full-function fishing kayak with the option to paddle or motor. At 14 feet long and 29 inches wide, the Thresher is designed for plying long miles through rough water. A large hatch in the cockpit allows us to pack the boat with gear and store our rods when the going gets rough. The low-profile, ventilated AirPro seat is a perfect compromise between comfort and performance. The Helix MD is driven by a German-engineered Torqeedo electric motor topped with a powerful lithium-ion battery. We’d brought along spare batteries and solar panels to charge the batteries. By the time we declare the island bear-free and set up camp, it is late afternoon. We suit up and put the boats in the water. Walk the kayak past the shore break before installing the motordrive. The Helix MD has a chassis about the size of a leg of lamb and surprisingly light. I drop it in the FlexPod OS scupper, wiggle it into position and latch it tightly. The throttle control is connected with a cable. I hit the power button and a digital display shows speed and range. The unit connects to the GPS signal and I get location data. I paddle the kayak through the kelp beds fronting our cove, then ship my paddle and push forward on the throttle. There is a whirring sound and the kayak moves across the water as if by magic. Sporting a half smile, I wag foot pegs controlling the rudder to see how it responds, then push the throttle forward as far as it would go. Grinning like a certified idiot, I feel like I’ve been shot out of a cannon. We motor out toward the reef. I pick up my rod and let out line to bucktail for salmon. I am about to put my rod in a holder when I realize I have both hands free. As Steve pulls alongside, I pick up the camera. 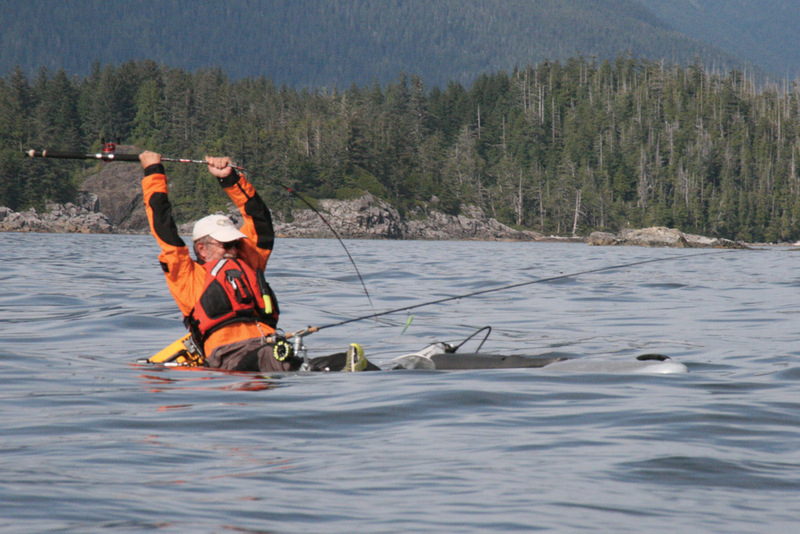 We troll along the southern flank of the reef, a place we have caught salmon before. But after a short while with no sign of fish and the hour growing late we decide we better catch something quick. We decide to scoot for open water around the other side of the reef, a hot spot for ling. We knife into incoming swell and power through a surge channel into open water, finally, with waves breaking over a shelf of exposed rock just in front of us. A bed of bull kelp sway and bob in the vibrant current. 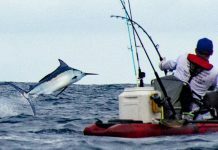 We each tie on a big jig and drop it to the reef. Steve is only halfway down when something big climbs aboard. Whoom-whoom-whoom, his rod tip disappears up to the middle ferrule, his reel slips great hanks of line. “Whoa!” he shouts like a rodeo rider. I hear Steve but the fish can’t; it was busy swimming like hell for the kelp. 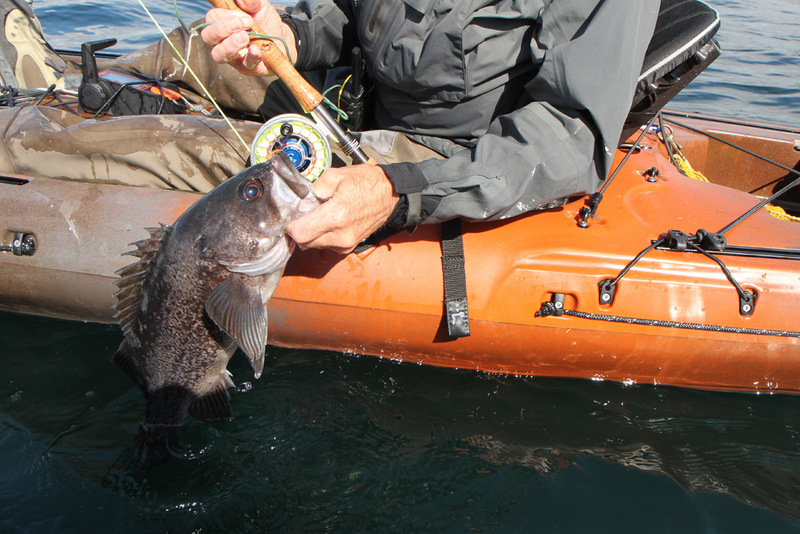 Steve turns the fish and fights a dogged struggle beneath the boat. By the time it reaches the surface he has net in hand. A turquoise and black ling cod lays quietly for a moment before it goes whacko. Steve scoops it up as neat as a baby from a crib. It’s big. “That’s too much fish for one night,” I say. He looks at it. “You’re right.” And he turns the huge fish back to the kelp. “Hope there’s another one down there,” I gulp. My concern is unfounded and we easily catch a pan-sized ling for dinner. Later, on the beach, we gently pan fry our aqua-blue ling fillets in olive oil and garlic as the sun sets in a blaze of glory off the tip of the Cape of Storms. When dinner is over, we let the flames turn to coals as the stars bust out of a clear night sky. We are in celebratory mode. We have made the island and found our traction in very short order. “To the week ahead,” I say, decanting a local, island-brewed Mount Arrowsmith IPA from one of our Klean Kanteen growlers and I raise my glass. Base camp view of our white sand beach and clear green water. We spent each day in the saddle and each evening cooking our catch. Salmon were far and few between but everything else showed up in spades. The wilder the water we fished the bigger our catch. Ling especially liked the exposed, rugged water. It was handy to have one hand on the Helix MD throttle while we jockeyed around the surf zone. 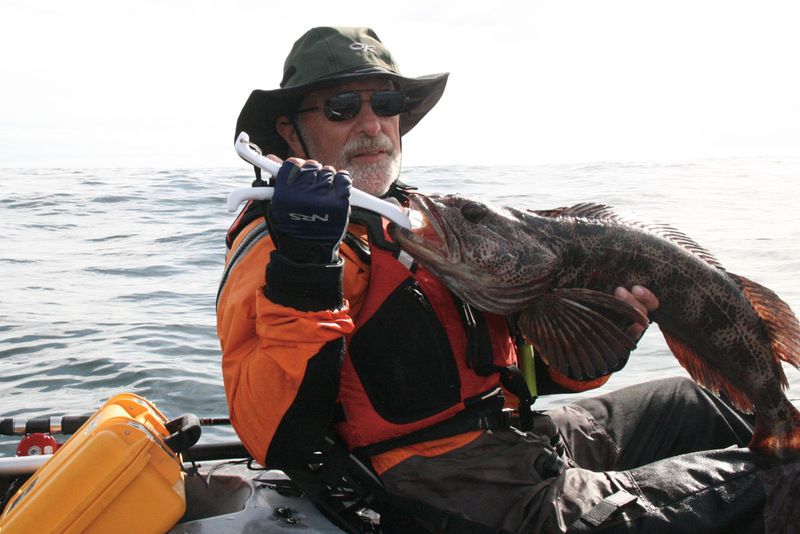 We headed to the outside to fish off the bull kelp beds for ling when we wanted fresh fillets on the dinner table. For pure sport fishing, it was black bass that cooked our bacon. There were two distinct fishing zones: the calmer waters behind camp and the open water fronting the rocks and reefs. 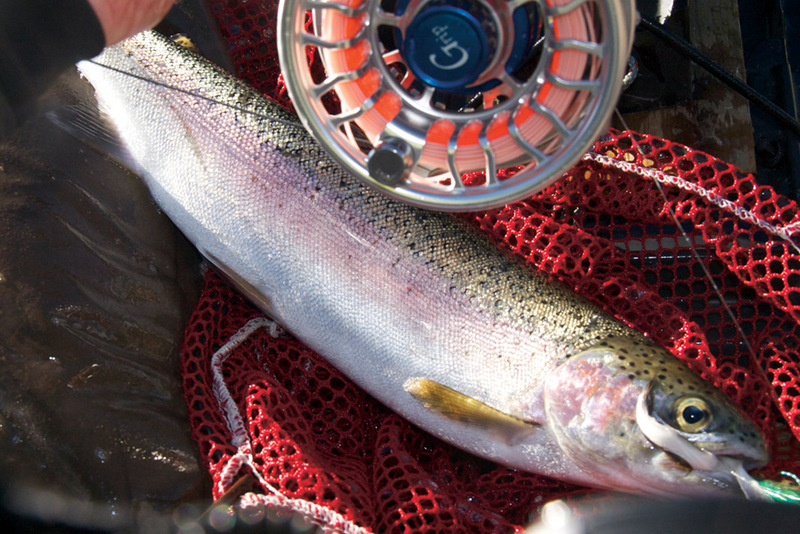 If it was rough on the outside, or we wanted to focus on fly fishing, we’d kick back inside. Black rock bass can’t stand the surge of open water; we find them spread out in protected water. 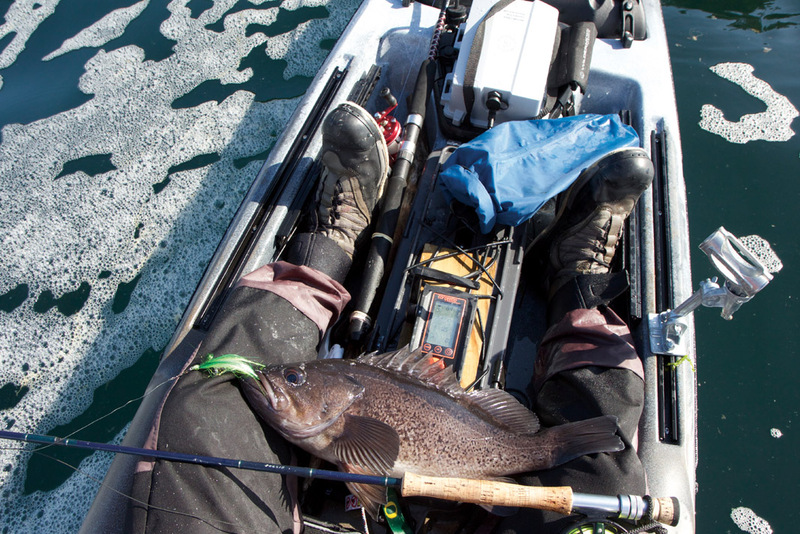 Our favorite fly was Chou’s Borracho Baitfish, downright lethal when twitched across the front of a kelp bed. Blacks can get playful at the top of the water. When we would hear them chasing baitfish we’d cast bushy dries in the kelp. The practical side of motor power had us quickly reaching distant reefs or river mouths that would have been a slog with the paddle. We parted some pretty big seas, jockeying around reef breaks and big storm swell trains. The boats felt very stable. The Helix MD was perfect for bucktailing for surface coho. I could hold the rod in one hand, find the zone, relax, wait to feel the sudden strike of a bright coho at the end of the line. The Thresher was responsive in the danger zone. Kicking the motor in reverse quickly backed me out of the froth. There is a split-second delay between hitting the throttle and the boat jumping into action, but once the prop started spinning the big kayak was quick to listen. The battery lasted all day fishing the reefs surrounding the island, but on a long haul under full power with a heavy load, the battery petered out before the day was done. If long distance touring is on the menu, an extra battery is easy to pack for peace of mind. Launching and landing on a shallow beach requires retracting the prop. To go ashore, I chose to jump out of the boat in waist-deep water and pull the motor out of the deck. It’s possible to pull the motor out without jumping out of the boat, but on a difficult landing I preferred to pull the motor and secure it before crossing the shore break. Seaweed also shuts the motor down in a blink. There is a protective device that resets and starts the motor right up. 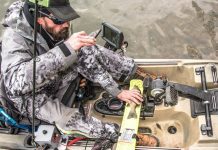 On a week-long excursion, the Thresher and Helix MD let us focus on fishing and explore new waters that would have been a challenge under paddle power. Combining the stability and comfort of full-size sit-on-top with the reliable power of a lithium-ion motor was the best of both worlds. Rob Lyon is a freelance adventure journalist and author. 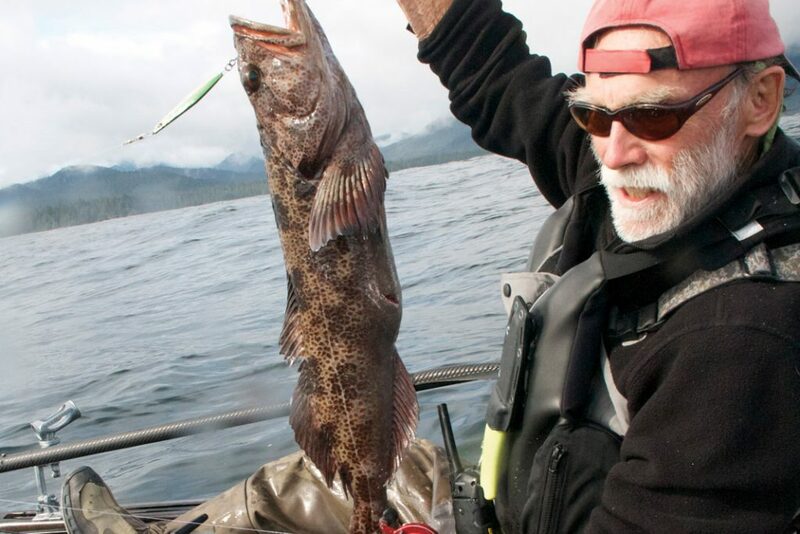 He has a basecamp in the San Juan Islands, where he lives with his wife, Pamela. Read about his adventure on the Owyhee River at Rapidmedia.com/0775.